Using Your Tools – Spiritual Warfare | CAN YOU HEAR ME NOW! You see, her daughter was completely unaware of what had been going on over her so-called “absence” from the bus she rides every day home from school as she was on the bus the entire time! Her mother had straightened her hair that day before school, and that day it was long and straight instead of full-of-curls leaving her classmates and bus driver unable to recognize her as she sat in her seat. It was business as usual for this young girl and she had not a care in the world, allthewhile her mother was imagining the worst of the worst! My friend said that it was about an hour later that she returned back to work, puffy eyes and all, stopping first though to think about how she did not trust in the Lord that from the start. Jesus had her always, but because she let panic set in before she had time to think…she reacted and took action but had she turned to the Lord first thing, she would have rested because He truly had her all along – He was totally on top of the situation! She was happy, safe and blissfully unaware of the danger her mother was expecting her to be in but again, He had her all along and she should have known He was always in control and would have kept her out of harm’s way. We always have to “react” (in the flesh) when it comes to our children, don’t we? We are their parent – they need us to survive, to live, to stay safe, and without us, they could never be any of those things, right? Well, Jesus just made a huge statement here and that was that they are also HIS CHILDREN and no matter what, IT IS HE THAT KEEPS THEM SAFE and regardless of how much we worry and fret, it’s all done in vain because bottom-line, THE BUCK STOPS WITH HIM! This reminded me of the time when my son Trey, who passed away at the age of 16, was 5 years old (just turned 5) and he got lost at Six Flags in St. Louis, MO of all places! I had taken him and my daughter Tara who was 9 at the time to the enormous amusement park along with a girlfriend of mine and her son who was 8. I remember that we put the kids in the line to the Log Barrel ride that races down the water and then we carefully walked to the exit gate where they would complete their ride and it would come to a halt. I mean we were right there and could see everything they did. As we were standing there talking, here comes the kids off the ride – minus one, my five year old son Trey! I asked his sister, “WHERE’S TREY?” She looked at me, along with my friend’s son and said, “He’s with you. He got mad right after you walked away and said he was going to wait with Mom and didn’t want to ride the ride with me.” Translation: They got into a fight and Trey started pouting in his usual Trey way. Well, you can imagine my panic, my horror and my thoughts! I made my daughter repeat this story at least 5 more times – going back and forth from the entrance to the exit and no Trey. We looked and looked, me in a flood of tears the entire time. Then, I started running through the park like a CRAZY, OUT-OF-CONTROL WOMAN screaming, “TREY! TREY!” The “Lost & Found” security department as they called it, was clear across and at the south side of this huge park and I had to have ran back and forth from that point to the far north side, where we lost him, at least 20 times…still screaming but now staring wild-eyed into total strangers faces yelling, “Have you seen a little 4 year old boy about this tall, wearing this shirt and those pants? Oh, he is beautiful and his name is Trey and are you sure you haven’t seen him?” Then, my mind went to that place we wish we could avoid but we can’t – that place of “What if someone took him to the bathroom, put a dress on him, made him look like a girl and kidnapped him from the theme park???? ?” Oh, I just knew that was exactly what had happened – no question in my mind! So, I ran back across the park, under 2 bridge walk overpasses (like a shady tunnel people where relaxing under and out of the hot son) for about the zillionth time, still sobbing but now, I ran faster screaming at the top of my lungs for all the hundreds of people to hear, “CLOSE THE PARK! CLOSE THE PARK! SEAL OFF THE BATHROOMS AND SEND ALL YOUR SECURITY GUARDS TO CHECK EACH ONE! CHECK EACH CHILD THAT TRIES TO LEAVE THE PARK! SOMEONE HAS MY SON, SOMEONE HAS MY BEAUTIFUL, BEAUTIFUL LITTLE BOY!” Yep, can you just imagine this and what those poor normal people sitting under that tunnel type bridge pass thought each and every time they saw this absolutely insane woman, who had “lost” her child at one of the rides (oh trust me, they all knew the story by then as it was almost 2 hours later). I still think about that – I had to look like I had truly lost my mind! Well, we then decided to go back to the Log ride that we first were separated at for one last check and I remember I was standing there, looking every which way, trying so hard not to go all Shirley MacLaine in Terms of Endearment on, when all of a sudden, I see the top of a very small head coming up over a slight hilly walk-way. My heart started racing and when his whole face came into view, I cannot express to anyone the peace/relief and total surrender I felt. 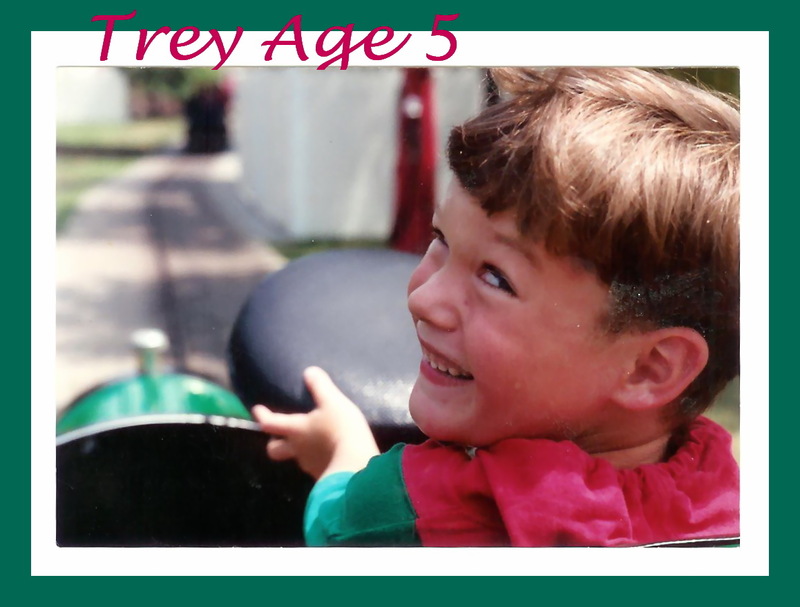 THERE HE WAS, THERE WAS MY BEAUTIFUL BABY BOY – THERE WAS MY STINKER TREY! He was walking with his head down but his eyes looking forward and wearing his signature “Trey Pout” as we called it. I yelled his name and ran in a full-force sprint until I scooped him up into my arms and kissed him all over! Part of me wanted to spank him but all of me just wanted to love every inch of him! How does that not just tickle you to the core? He was trying to cry, feel bad and say he was sorry all at the same time, but again, he could not contain his over-the-moon smile that was so full of “YES, I RODE THAT BIG OLE’ ROLLER-COASTER NOT ONCE, BUT TWICE ALL BY MYSELF” childlike-pride! Today, I thought of this all day and I learned a huge lesson from our Lord today. No matter how lost or bad-off we think our children will be without our protection, He is always their Main Protector and Jesus never lets them out-of-His-sight no matter what, whether we can see it or not. This reminds me of Trey now and when he first died in January 2005. I just couldn’t imagine him being by himself, so lost, so alone, so scared – what he must be going through, who is watching over him to make sure he is safe – it’s all I could think about. Well, both Trey and Jesus sure told me, didn’t they! Look who is just as safe, sound and filled with pure joy & happiness, just as they were that day I thought I completely lost him at the amusement park because again, Jesus had him all the way! I realize and know without-a-shadow-of-a-doubt that Trey has always been in the safest hands possible – God’s Hands and nothing I could do that day, when he was 5, or that day when he was 16, could ever match the ultimate love and protection and safe-keeping Trey would always receive from our Father in Heaven, never! When my flesh wants to take me back to the place of sadness, that very dark place I stayed in for way way too long, I think about and picture that little boy of 5, walking over that little hill with his head down but eyes forward, then looking at that little hidden smirk of a smile that silently told me that he had just had the time of his life! While I, his 30 year old mother (at that time) was at the point of calling in the National Guard, thinking I had let my son down and I would never see him again, he had not a care in the world – he never once thought of the bad he might or could experience, only the fun, the good and the happiness he was walking in. This is what Jesus is telling me now, walk in pure faith as Trey did that day and know unquestionably where he resides now, with Me and that regardless of my worry and sadness over his absence, he has been blessed and is blessed to live the life he now does and nothing from this earth is missed, nothing is comparable so be happy for him and never hesitate in showing joy because whatever we think they are missing in their life here on this earth, they are thinking the same about us only we are truly the ones missing out, not them, not Trey! He has it all! So next time any of us want to worry about our children, think of Trey. When those moments come to us and we too want to start worrying over our life and trials we live and face on this earth, think of we too have waiting for us and that Jesus also has His Mighty Hands upon our daily lives and no matter who many times we want to “Call-in-the-National-Guard”, He is already here! This picture of my son Trey was taken an hour or so before his “adventure” in the amusement park.